When there is a track meet – particularly one as exciting as the 2016 U.S. Olympic Trials - my house fills up with out-of-town friends and family eager to watch history in the making. And so it was the day after the Fourth of July and half way through the ten days of trials that we realized the five of us needed an adventure – one that got us out of the house and shook up our track fan routine for just a day. A little re-set, you could say. 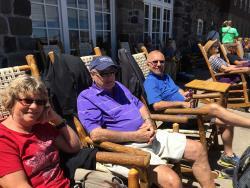 Our group included myself, my husband Craig, my 83-year-old father and two dear friends from Winnapeg, Canada – Archie and Cathy. Now Eugene has a lot to offer visitors but my friends had visited many times before and we’d checked off a lot of the “must show when hosting” list such as wine tasting, the Eugene Ale Trail, historic Old Town Florence, the Saturday Market, hiking Spencer Butte and so forth. How else could I wow them? We’d already set the bar pretty high. And then I realized – we had a national park in our backyard! Crater Lake National Park is less than a three hour drive from Eugene and would make an easy day trip – especially because the drive there is so scenic with many cool stops along the way. Craig and I had been there many times before, but we’d be treating our guests to a marvelous natural wonder for their first time. We leave at 8 a.m. that morning when it is still cool but the sky is already sparkling with the vibrancy of early summer. We take Highway 58 toward Oakridge. This is a favorite drive of mine, one I’ve done countless times as a former ski instructor at Willamette Pass. 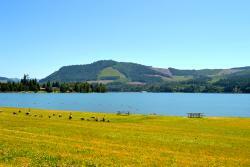 The curvy mountain road skirts the Willamette River and two reservoirs – Dexter and Lookout Point. In the morning calm, Dexter’s surface reflects the mountain forests and the historic Lowell Covered Bridge in exquisite detail. We cruise through Oakridge, a former lumber town that now is a hub for mountain bikers and outdoor adventurers. Today we don’t stop, but often the local microbrewery Brewers Union Local 180 is our destination. Their authentic British Cask Ale has received much acclaim, even getting a nod from Bon Appetite magazine. We do stop at Salt Creek Falls however – after all, this journey is about natural wonders and Salt Creek Falls is Oregon’s second highest waterfall. It is also very easy to see with a viewing platform just feet from the parking area – an important feature for my Dad. I like this waterfall because it is so dramatic and is impressive in every season. The site is also ideal for stretching our legs and taking a quick restroom break. As our drive continues we pass more scenic mountain lakes including Odell Lake, popular for fishing. 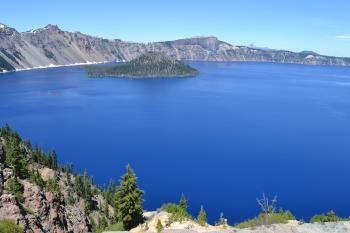 But we eagerly press on, headed to the deepest lake in the United States – Crater Lake. The caldera of Mount Mazama which erupted over 7,000 years ago gradually filled with rainwater and snow melt. Now at almost 2,000 feet deep and extremely pure, with visibility to 400 feet deep, Crater Lake’s deep blue expanse is memorizing. It’s one of those sights that everyone should see at least once in their life. 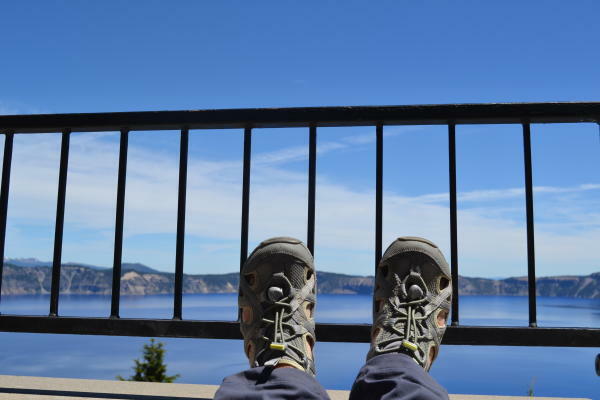 We enter Crater Lake National Park on the north side and begin driving up to the historic Crater Lake Lodge – we will arrive in perfect time for lunch! Crater Lake Lodge is an impressive building perched on the crater’s rim one thousand feet above the lake. 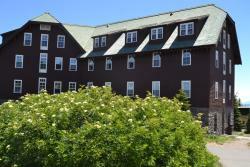 Built in 1915, it features 71 guest rooms, the Great Hall with a massive fireplace and a large dining room. Weathering deep snows, neglect and closures during economic declines, the lodge was finally resurrected in 1995. Fifteen million was invested in refurbishing including steel supports, safety measures and hotel amenity upgrades on par to modern standards. The lodge still has its historic charm and quirks – no room is alike and not all have private bath or showers. There are no phones or TVs in any of the rooms. I feel swept back in time as we enter the large lobby. The dining room serves three meals a day and reservations are recommended. Lucky for us the wait time wasn’t long today and we were soon seated. The food is hearty and highlights Northwest sourced ingredients like Marionberries, hazelnuts, greens, Pacific Coast shellfish, trout, salmon and grass-fed beef. We enjoy sandwiches and salads and I sip a glass of Silvan Ridge Pinot Noir – right from Eugene! We sun ourselves in comfy deck chairs overlooking the brilliant blue of sky and lake. Relaxation takes over, seeping into every muscle as the silence coming off the lake settles over us like a thick blanket. I don’t feel the need to do anything but sit and enjoy. Eventually, we do get up to “walk off” lunch - lumbering between the lodge and the visitor center and even a few of us hike down to the Sinnott Memorial Overlook deck. Back in the car, we drive part way around the rim (some of the road is still closed) to view the lake from every possible angle. Patches of snow linger along the roadside, tempting us into impromptu snowball fights. Considering I’m in shorts and sandals, it feels fairly surreal. We exit on the north side of the park to loop back toward Eugene in a full circle with fresh scenery. 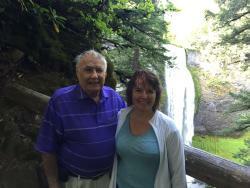 We stop at the Diamond Lake lodge and marina for an after-lunch-treat of ice cream bars, than follow the North Umpqua along the “Highway of Waterfalls.” How about seeing the third highest waterfall in Oregon? Sure! 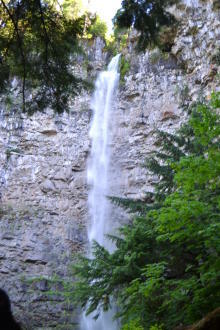 A moderate uphill hike of half a mile rewards us (Dad and Craig stayed at the car) with a splendid view of Watson Falls. There is even a little bridge at the base, so you can get right up to it. It’s dinnertime when we pass through Roseburg, so we stop at Brixs grill. But even with all the side trips we are home comfortably by 9 p.m. We’ve had a day of rivers, lakes and waterfalls – and pretty spectacular ones at that! Cathy, Archie and my Dad had a wonderful time and I feel like I just vaulted over the highest entertainment bar yet. Sign me up for the Olympic Trials of hosting house guests! Sally is the Vice President of Integrated Marketing for Travel Lane County. She has worked in local tourism for over twenty years and knows the ins and outs of all the region's wineries, craft breweries, waterfalls and covered bridges. Her favorite thing to do is ski, particularly at Willamette Pass where she was a ski instructor for many years. Sally loves Eugene - and you are likely to bump into her and her husband Craig out hiking, cycling or shopping the local farmers' markets.